The massive effort to rebuild Metrorail will continue over the weekend of August 10-12 with scheduled track work on the Red, Orange, Blue and Green lines. The work will begin at 10 p.m. Friday and continue through system closing on Sunday. Buses will replace Red Line trains between Grosvenor and Friendship Heights stations to allow for rail renewal/replacement, structural repairs, tunnel leak mitigation and related improvements. Two stations — Medical Center and Bethesda — will be closed. Red Line trains will operate in two segments: Between Shady Grove and Grosvenor, and between Friendship Heights and Glenmont. On each segment, trains will operate every 10 minutes between 9:30 a.m. and 6 p.m. and at regular weekend intervals at other times. Customers traveling through the work zone should allow about 30 minutes of additional travel time. Orange Line trains will single track through two work zones: between Foggy Bottom and Clarendon to allow for structural repairs, leak mitigation and drainage work, and between Stadium-Armory and Cheverly to allow for platform reconstruction. 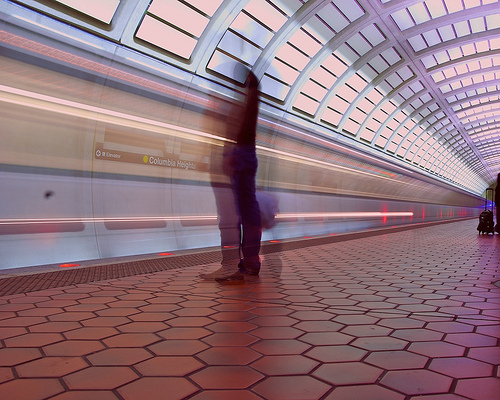 Throughout the weekend, Orange Line trains will operate every 24 minutes. Customers should allow 20 minutes of additional travel time. Blue Line trains will single track between Foggy Bottom and Arlington Cemetery to allow for structural repairs, leak mitigation and drainage work. Throughout the weekend, Blue Line trains will operate every 24 minutes. Customers should allow up to 20 minutes of additional travel time. Green Line trains will single track between Fort Totten and Prince George’s Plaza to allow for track maintenance, tie and fastener renewal and third-rail power improvements. Throughout the weekend, Green Line trains will operate every 16 minutes. Customers should allow about 10 minutes of additional travel time. As a result of the work zone, all Yellow Line trains will operate between Huntington and Mount Vernon Square only. Customers traveling to/from stations north of Mount Vernon Square should use Green Line trains to complete their trip.